This article describes how to manage your observees and allocate individual who you want to carry out the observations and support. Now you can start by clicking on the 'Manage Observees' icon. Adding in your observees is simple just click on the 'New Observee' icon. You can then select appropriate individuals from the drop down list. You will notice, as you add individuals the list gets smaller. This is because you can only add an individual once. Please note: If the individual that you need is not in the list go back to step 3 and check to ensure you have allocated the licence correctly. All individuals will start to show in your list as you add them in. If you add an individual by mistake you can delete them by clicking on the delete icon. This will only delete the observee if you have no activity assigned to them. You now need to manage observers. This feature allows you to allocate who you want to be assigned as observers or contributors for each individual. To do this click on the 'Observer Management' icon. You can now add your observers for the individual selected. You can allocate permissions. If you leave these permissions empty the individual can still read the observees observation reports and action plans. They can also contribute by adding notes. Please note: The observee will show up in the list. You do not need to allocate for example, Neil Donkin for Neil to be able to see his observations. We recommend that you tick the 'Assign to all observation categories' to save you from having to add these individually on the next screen. You can edit these permissions and delete an observer at any time by clicking the appropriate icon highlighted below. If you didn't assign to all observation categories you can manually add them. Only the specified categories will show up when the observer looks at their schedule. Simply go into edit observer as seen in the screenshot above and add you categories from the list. 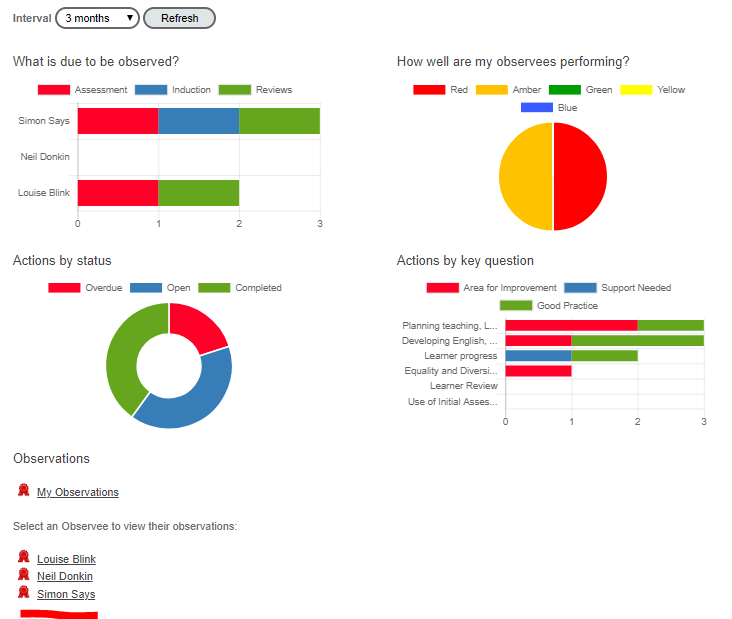 You are now set up to start scheduling your observations for each observee. On your dashboard select the observee you want to start scheduling activity for. Once you are on the observers page click on the 'Scheduling' icon will appear. 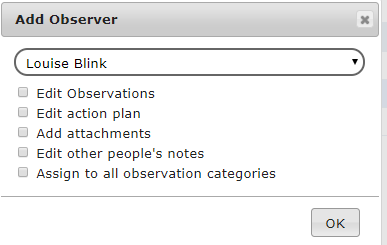 You can now select the sampling type, assign the observer and decide when you want this activity to start from. If you want to schedule interval to repeat click the End Date 'never' box or specify an end date. 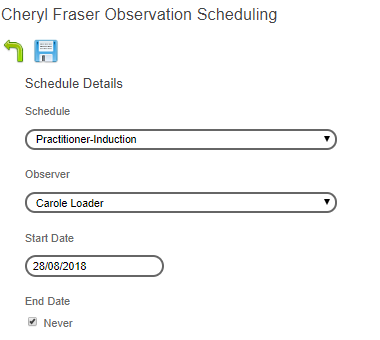 As you add your different types of observations they will show up in the observees scheduling list. If you have any further questions please do not hesitate to use your online chat.